This article won the Medal for Best French Travel writing from the Comite National des Conseillers du Commerce de la France. There is body of opinion that believes bagpipes make a great sound, in the distance – the further the distance, the better the sound. Those who love them passionately deny that the reason they march is to get away from the noise! 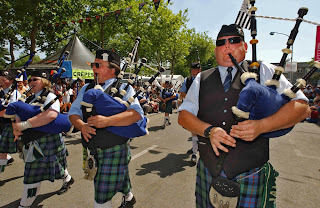 Every August they travel in droves to Lorient, on the south coast of Brittany, where the huge Festival Interceltique takes place. But it’s not just for pipers, there is rock and jazz, country and Cajun, blues and traditional. About two hundred thousand Celtic culture vultures from Ireland, Scotland, Wales, Cornwall, Isle of Man, Galicia, Asturias (our Spanish Celtic cousins) and of course, Brittany itself invade the town for ten days of intense competition, parades, seissiúns and general fun and games. There are more than 250 different events involving 4,500 musicians and artists. You could call it a French Fleadh. Music is central to the festival but the visual and performing arts play a major role. Last year two Irish painters, Maurice Quillinan and Robert Ballagh exhibited. The atmosphere in the town is carnival, with street theatre and buskers, markets and fast food stalls in an international blend of language and music, dance and costume. Conversations are in French, Irish, Breton, Welsh, Scots Gaelic, Cornish and Galician, and often, it seems, a mixture of many, especially as the night turns to morning and the serious business of cultural exchange continues. You will also get by nicely in English. Workshops are held on anything remotely related to Celtic culture. There are competitions for everything, the crowning glory of which is the clash of the pipe bands at the local football stadium. The sound can be heard in Paris! There were pipe bands from all over Ireland, with the unlikely cultural mix of the Barrs (St. Finbarr’s Pipe Band from Cork) playing with Cullybackey Caladonia Pipe Band from Antrim. The Naval Service Pipe Band, a relative newcomer to the business, marched through the town for the sheer fun of it. By day they competed fiercely in parades and contests. After dark, they joined forces to compete over pints of Murphy’s Irish stout (available just about everywhere) and bottles of French wine. We were distracted early one evening by the sight of a few Barrs entering a Police station, complete with pipes and drums. Journalistic instinct (just plain nosiness) got the better of us and we joined the small party for a very informal recital arranged by band member, Garda Sergeant John Burke of Barracks Street Station for his French colleagues. Any notions we had that the piping in pubs and streets was loud faded fast with the sound of four pipers and two drummers playing in the tiled corridors of the small cell block. Acoustics is a term that cannot adequately cope with the result, which made the efforts of Guns ‘n Roses seem like the recital of a string quartet in a large field. The Gendermerie were delighted and responded in traditional French manner – the wine flowed. There are plenty of places where the night goes on until the morning and the craic is ninety with pipers and fiddlers and all manner of instrumentalists and singers in fine fettle with apparently endless energy. The fun and games begin with the clash (fortunately rare) of the pipes – Uileann versus War. The Uileann fans look with scorn on the Scottish version, adopted by the Bretons in the late 1940’s and since made their own. Uileann pipe purists like to think that the Irish invented the bagpipe and in mischievous mood sent it to Scotland. The Scots, we are told, never got the joke. Apart from happenings musical and cultural, there is plenty do around Lorient. A cheap bus pass brought us to miles of fine beaches and all facilities for sailing, scuba-diving, fishing, horse riding, golf and most other leisure activities. Much of the joy of Brittany is gastronomical, especially its fish specialities. This is home to the crêpe, available everywhere, with just about every conceivable filling. It is worth a visit for those alone, and, of course, in these parts the kings of the sea, les moules. Centre piece of the festival last year was the première of the Poeme Symphonique, “Anne des Iles” by Herve Cavelier. Dublin piper (uileann!) Gay McKeon, was the principal soloist and brought the house down with an electric (!) performance. There was talk of a recording being made in Paris at a later stage. Watch out for it.